Knole House is an historic house built over 600 years ago. There have been archbishops, kings and others who owned this home over the centuries. Now owned by the National Trust, it is being refurbished and restored with a budget of over 19 million pounds. The original house was an Archbishop’s house, it was eventually purchased by Archbishop of Canterbury, Thomas Bourchier in 1456 and was used as a country retreat for the Archbishops. It was later surrendered by Archbishop Thomas Cramer in 1538 to Henry VIII. During the years that the Archbishop of Canterbury lived there, he created a deer park which is now Kent’s last medieval deer park. He fenced the acreage and it became home to a wild deer herd. The 1000 acres of today are home to over 350 deer. There are two different kinds, one is the Fallow and the other is the Sika deer. The fallow deer have a smooth spotted coat which darkens in the winter. The males have a flattened antler which falls off annually. This visit was in September so perhaps the colors were changing for the winter. The Sika deer have a darker brown coat and spikier looking antlers. It seemed that we were seeing the fallow deer on our visit. My thoughts were perhaps the two herds have mingled and are showing the combination on their offspring. These deer are free to wander the grounds so were within just a few feet from the tourists. They are not approached by the visitors who are also not to feed them, but they show no fear. There are staff members that look after these well cared for animals. In 1603, Thomas Sackville, cousin to Queen Elizabeth l, bought Knole House and it has been in the Sackville name ever since. The family symbol, the leopard can be seen inside and outside, as well. His descendent, Charles gave the Knole House to National Trust but the family retained ownership of the Gatehouse Tower. Restoration was being done while we were there so many of the furnishings and priceless antiques were displayed behind glass containers. We were not able to take photos inside this very large house, with a roof that is a total of 6.7 acres, but were seeing many rooms, halls and galleries that were full of hundreds of portraits from the history of England. Incredible sights to be seen. Edward Sackville-West, usually called Eddy, lived in the Gatehouse Tower from 1926-1940 and his apartment was opened to the public in June 2016 so we were able to climb the steep and very narrow spiral staircase and visit some of those rooms. He was a very colorful gentleman with many colorful friends who spent time with him here. There were many stories chronicled including the visits by Virginia Woolf who wrote the book “Orlando” in 1928 with Eddy’s cousin Vita Sackville that was set in Knole. 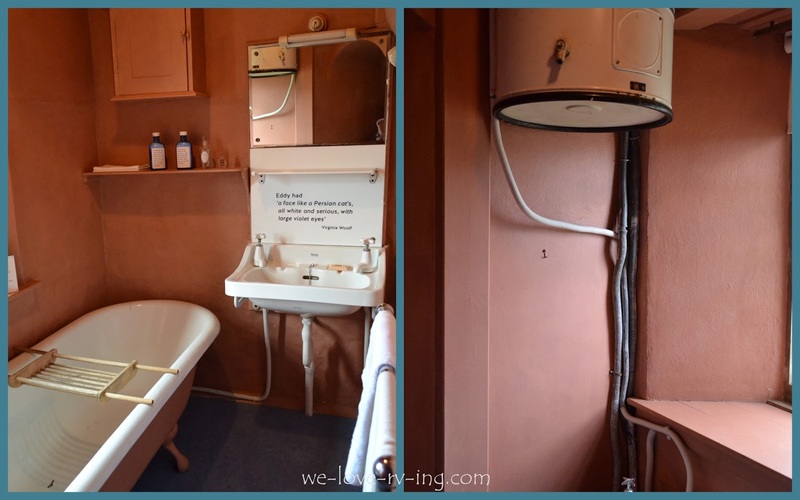 While visiting the private apartment that still belongs to the Sackville family, I took photos of the ‘modern’ looking bathroom; the water tank is suspended above the bathtub. It was then I learned that photos could not be taken in there, either. Some places are very lenient, others are very strict about taking photos, often due to the damage that flash can do to antiques. Note the message below the mirror. The history of the Knole House is fascinating in many ways. The Sackville family, Virginia Woolf connection and many more colorful stories are interesting but also the antiques and art collection collected and showcased was very impressive. Seventeenth century letters were found in the restoration, what a great find that was! We enjoyed a lunch in their cafeteria before heading back home. Another day of enjoying the history of England. If you wish to learn more about Knole House or National Trust, click here. To share our visit to Scotney Castle, click here.